A Top-Rated Portable Indoor Air Purifier with 360 Degree Pollutant Removal, 15 lb Stronger Impregnated Activated Carbon, Zeolite, Medical HEPA and Pre-Filter for Maximum Removal of Airborne Dust, Pet Dander & Odor, Tough Chemicals such as Formaldehyde, Benzene, VOC's, Smoke & Household Odors in Medium and Large Rooms Up to 1500 Square Feet, 5 Year Warranty & 5 Year Filter Life, All at an Affordable Price. Maximum Particle Removal of Dust, Dirt, Pet Hair, Pet Dander, Mold, etc. Maximum 99% Removal of Synthetic Chemicals Odors, Fumes and Gases from, Paint, Fragrances, Cleaning Products, Beauty and Office Supplies, Etc. Red Cross and FEMA Recommended for Post 9/11 Use! Best for: Strong VOC, Chemical, Paint Fumes, Pet, Cooking, Smoke and other Odors and/or Heavy Particle Pollutant Removal in Medium to Large Rooms 700 – 1,500 Square Feet. 1.5” Thick 15 LB Potassium Iodide Impregnated Activated carbon and zeolite filter for 99% VOC, Chemical and Odor Removal - for Better Performance, No Off Gassing. Poor indoor air quality is proven to cause fatigue, allergies, and asthma to poor sleep, as well as more serious health complications. And tougher chemicals like formaldehyde, benzene, natural gas, chemicals from building materials can create even more hazards. 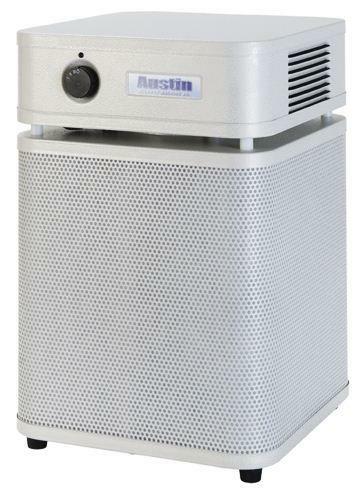 Austin Air created the HealthMate Plus as an affordable way to improve indoor air quality in larger rooms with tough particle, odor and heavier chemical pollution. With the HealthMate Plus, you can quickly remove dust, smoke, odor, pet hair & dander, chemicals like formaldehyde, CO2, H2S & other sulfides, nitrates, ammonia, chlorine bleach, acid gases, VOC's and odors all at the same time, in bedrooms, living roms, basements, large offices and many other spaces. 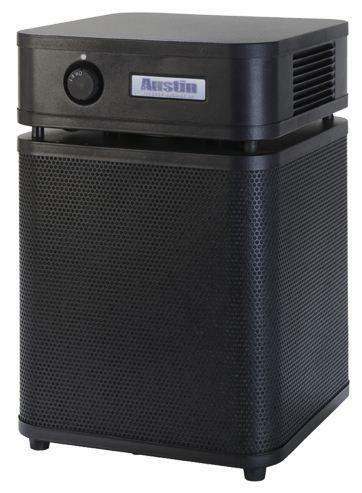 The Austin HealthMate Plus portable indoor air purifiers are known for eliminating more particles, cigarette smoke, cat & dog smells and chemicals than most air scrubbers for sale, and include a top-rated 5 year activated charcoal & HEPA filter, up to 1500 square foot coverage and a 5 year warranty. The medical HEPA filter is the same grade used in many hospital air filtration systems, consistently removing 99.97% of particles and fibers as small as 0.3 microns, and 95% of particles as small as 0.1 microns--on the first pass of the air through the air cleaner. 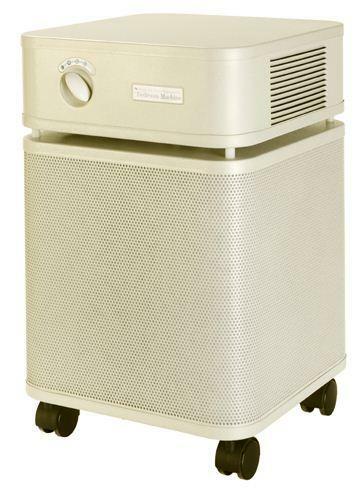 The pre-filter stops larger particles from prematurely clogging the HEPA filter, thus extending HEPA filter life to 4-5 years, not 4-5 months as with many cheap air cleaners with no pre-filter. The 15 lb activated potassium iodide impregnated carbon and zeolite filter removes 99% of VOC's, and a wider range of chemicals and odor pollutants, reducing allergy and asthma reactions better than air cleaners with only standard carbon filtration. Zeolite is used in cat litter for odor removal and works well with the activated carbon for removing many VOC related odors. This combination of filters and strong 400 CFM allow the HealthMate Plus to provide effective removal of a large variety of pollutants, all at an affordable price. One of the Austin HealthMate Plus' best features is the 360 degree intake, removing pollutants from all directions at once, which is proven to clean the air faster and better than similar sized units with a bottom or side intake. The body is made of quality powder coated steel, not plastic, components are top-quality and everything is tested prior to offering for sale. If you're looking for a quality, made in USA large room chemical, odor and particle removing air cleaner for your home, office or other space up to 1500 square feet. the Austin HealthMate Plus is tough to beat. Order yours here at a discount online sales price and feel the difference truly clean air can make! There are not many official online retailers of Austin Air air quality products and unfortunately the internet is full of scams. As a general rule of thumb, if the deal seems too good to be true, it probably is. Cheap cut rate online deals often end up being a used or refurbished unit, which do not come with Austin Air's top rated 5 year warranties. Or even worse, you may end up buying a cheap discount air cleaner that doesn’t have the energy efficiency, features or real air cleaning power provided by top-rated Austin Air air filtration systems. When you buy your money and energy saving Austin Air air filtration products from us, you get a brand new unit, at the best possible price, with Austin Air's amazing 5 year warranty. 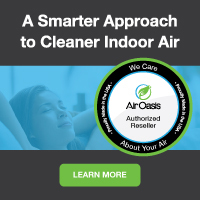 Our innovative partnership with Austin Air allows us to ship directly from their warehouse, which cuts out the middle man and eliminates the high operating costs of traditional brick and mortar big box stores. These savings get passed directly to you, allowing us to offer brand new allergy and asthma symptom-eliminating Austin Air air purifiers and filters at the best possible everyday cheap discount online sales prices. And buying from us is definitely better than direct. If you buy direct, you'll have to pay shipping. Buying from us, however, you always get fast free ground shipping as our thanks to you for shopping with us. Austin Air Systems, Inc. was Chosen by the Red Cross and FEMA to address the air quality concerns in post 9/11 New York. "I live in Manhattan about 4 miles from the World Trade Center site and returned home that evening to find myself coughing and unable to breathe in my apartment. I went into my bedroom, closed the door, and turned my Austin Air cleaner on high. For the rest of the night, I was able to sleep without any further discomfort. Thanks Austin Air, you really helped me get through the aftermath of 9/11."